Updated with industry benchmark petition conversion rates (4/11/12) and illustration by Lyla Duey (8/18/12). 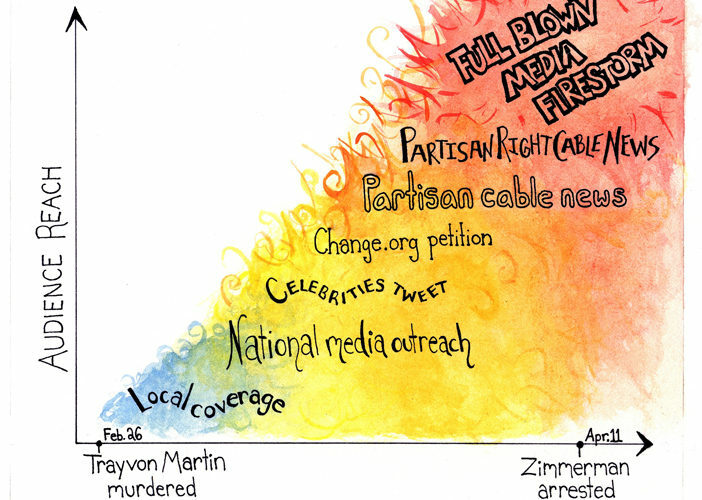 For weeks, the only Trayvon Martin coverage I saw was on Twitter, where every progressive I knew had shared a link to the Change.org petition. Eventually, I saw more media attention around the story. This led me to form a hypothesis that people talking about the story online, and specifically, linking to the Change.org petition, kept the story alive long enough for the national media to pick up on it. I looked into all of the data I could find, including some provided by Change.org, and found out that my hypothesis was incorrect. But the story of how Trayvon Martin became national news, weeks after his death, is still a revealing portrait of our media. On February 26th, during the halftime of the NBA All-Star Game, 17-year old Trayvon Martin went to buy some Skittles and an iced tea. He was confronted by self-appointed “neighborhood watch leader” George Zimmerman, who eventually shot Trayvon in the chest, and killed him. (The New York Times has the most complete summary of the evening that I have seen). The story has ignited a national debate over racial profiling, “Stand Your Ground” laws, and gun safety, with observers dividing along the usual political and racial lines. But the most fascinating media-related development in this story has been the initial draught, and then eventual flood, of national attention. After poring over the data and other articles about the press coverage, it’s astounding how deliberately this media attention was delivered through a combination of traditional publicity, partisan media outlets, social media influencers, and an online action platform to capture the energy generated by each of these engines. Travyon Martin was shot on February 26th. Zimmerman had confessed to the shooting and turned himself in, but was not charged or even arrested by the Sanford Police Department. The story was covered the next day like most crime stories, by a local television news channel. Fox 35 Orlando’s news program reaches in the ballpark of 20,000 viewers. On February 29th, the Orlando Sentinel reached another potential 227,593 potential readers with the story. On March 2nd, the Miami Herald picked up the story and published it to an additional 164,332 people. For another six days, no coverage. It wasn’t until a Reuters story published March 7th, and then CBS This Morning on March 8th, that the story began to take off, a full 10 days after Travyon Martin was murdered. How Travyon’s parents, their lawyers, and online activists were able to train the national media’s spotlight back to a story that had, by all traditional measures, run its course, is a case study in navigating the modern media ecosystem. It involves Change.org, an emerging powerhouse combination of social media and activism. But above all, the story’s resurgence is due to a savvy media strategy by the Martin family’s lawyer, Benjamin Crump, who set everything in motion well before the Change.org petition was created. In Trayvon’s case, they alerted the news media more quickly. They phoned the Rev. Al Sharpton almost instantly, and organized marches with local civil-rights activists. They also started pressing for federal involvement and alleging a cover-up from the get-go. “The attorney called and said, ‘I need you again,’ ” Mr. Sharpton recalled in a telephone interview from Florida, where he staged a rally Thursday night to call for justice. He took his radio and TV shows with him, thereby amplifying his call. “I got on the phone with Tracy Martin and I told him, ‘It’s not going to be any fun, but this is the only way to find justice,'” Julison said. “You are going to have to bare your soul and express your emotions and your inner grief.” Martin and Fulton agreed. There was only one problem. At first, the media weren’t interested. Julison pitched the story to a long list of media contacts. After weeks of little to no media coverage, the story roared back to life on March 7th with the piece from Reuters and then on March 8th, with articles in the Huffington Post, TheGrio.com (an African-American online news property of NBC), and the first national TV coverage on CBS This Morning, produced by CBS’s Atlanta station. Crump and his team had done their job in reviving the story and taking it to the national stage. For some reason the mainstream media is not reporting this story. Shameful, call them, email them, don’t let this go! Ironically, the media coverage generated in the days prior by Crump and Martin’s parents was just beginning to hit the airwaves, and would be sending traffic Cunningham’s way in very short order. On March 8th, the same day Cunningham started the petition, the CBS piece aired and reached an estimated 2.56 million viewers. March 8th is also the first day where Google Trends shows any results for the query “Trayvon Martin”. (I’ve found it very difficult to measure the reach of a given Reuters story, given the news network’s enormous reach and the variation in which content their partners publish. Please leave a comment if you know a good way to measure this story). Cunningham’s petition grew from 217 signatures the first day to over 2,492 the following day, and continued adding over 2,000 new signatures daily for a few more days. When the petition reached 10,000 signatures, MSNBC reports, employees of Change.org reached out to Cunningham about transferring ownership of the petition to Trayvon’s parents, to which he readily agreed. The ongoing media pressure led to the release of the 911 tapes on March 16. In the audio of the tapes, Zimmerman is told to stop following Martin. The tapes led to increased media coverage and doubled traffic to the Change.org petition, with a disproportionate amount coming from social media. #Trayvon trended on Twitter for the first time the following day. If we look at just front page newspaper coverage from major US dailies, we see that Change.org signatures were indeed driven by social media, rather than newspapers. In this data visualization by my colleague Pablo Rey, you can see that neither the Washington Post nor the New York Times dedicated front page space to the Trayvon Martin story until March 22, days after the federal probes were announced. The front page coverage does little to drive new signatures on March 23rd or 24th, but may have contributed to the spike in traffic to the petition page on March 22nd. The actual stories rely heavily on photos of the public rallies, suggesting that these events may have helped provide editors with clear actualities to report (as well as front-page-worthy photos). It would be interesting to see front page coverage from the Orlando Sentinel or the New Jersey Star Ledger, both of which covered the story earlier, but their front page archives are not available at kiosko.net. Pew’s Center for Excellence in Journalism maintains a weekly News Coverage Index that show’s a given story’s penetration across the entire news ecosystem, and the percent of that week’s newspapers, online news, network TV, cable TV, and radio news featured the story. Their statistics back up Pablo’s findings that newspapers played very little role in this story’s prominence. The story doesn’t appear in the index at all until the week of March 19th, where it explodes on the scene with 19%, or almost one-fifth, of total news coverage. Cable TV (34%) and radio (25%) spent the most time covering the story, followed by online (15%) and network TV (13%). I started this investigation with the hypothesis that progressives linking to the Change.org petition online kept the Trayvon story alive while the national media slept. It turns out that this honor belongs to a few media-savvy lawyers and publicists, and a grieving family willing to talk non-stop to reporters in the pursuit of justice for their slain son. They forced this conversation onto the national stage, where progressives took the story and ran. So what role did the Change.org petition play? Petitions have long been attacked, and often rightfully so, as the worst kind of slacktivism. Advocacy groups and nonprofits sometimes use them to build their email lists and attract new members, and often times forget to even appropriately deliver the signatures to the intended target. Even when the advocacy group does everything right, public officials and their jaded staffers have grown accustomed to ignoring tens of thousands of names demanding something, going so far as to assume that advocacy groups just append their membership roles to a letter (I have never seen an instance of this occur). Change.org does a number of things differently than your average mass-emailed nonprofit petition. The platform was built to optimize every step of creating, delivering, and winning a petition campaign the way YouTube was built to make uploading, sharing, and watching videos a better experience. The company has shut down their issue blogs and bet the house that they can win social change campaigns through the effective use petitions, and help regular people as well as organizations win campaigns. One of the unadvertised benefits of hosting a petition on Change.org is that the platform is built and run by a crack team of some of the nation’s best organizers, online, offline, or otherwise. They help civilian petitioners choose a more appropriate target than President Obama for their campaign, and have in the past helped some petitions attract and optimize media attention (benefitting the specific campaign as well as Change.org). Talented organizers who were previously siloed across a variety of issues and organizations now sit next to one another in a giant room in DC’s Penn Quarter, building a platform to enable anyone from a fourth grade class petitioning The Lorax producers to Saudi women petitioning US Secretary of State Hillary Clinton. Change.org manages to activate non-activist citizens to hold corporations, institutions, and leaders accountable. They win, and frequently. They’re often small wins, sure. But the truly interesting thing, in my opinion, is that Change.org enables these many small wins, across many different issues, every single day, and provides a clear path for people to organize around their values whether or not they’re on a 501(c)3 organization’s email list. Their potential audience is much larger than any single advocacy group’s email list. The Change.org petition was not responsible for attracting national media attention to the case, but I might argue that it helped sustain the story online. The petition gave news consumers a place to act on the sense of injustice the story stoked within them. It also gave celebrities a reason to tweet about the story. Almost half of the 5 million visits to the Change.org petition over this time period were referred by social media. Given the scale of social media traffic, it’s entirely possible that having an action to link to actually increased the rates of people sharing the story online. It’s hard to measure the conversation independent of mainstream media coverage, but Pew’s Research Center for Excellence in Journalism has found that, as Trayvon Martin became the number one topic discussed on Twitter between March 26-30, “calls for justice (21% of the conversation) and sympathy for the victim (19%) were the top themes on Twitter,” both sentiments that lend themselves to including a link to take action. We can measure conversion rate. Thirty-seven percent of the people who visited the Change.org petition ended up signing it. Change.org petitions have almost certainly been optimized for this sort of conversion, but 37% is still a high page-completion rate for a petition. For context, the highest conversion rate found in the 2012 eNonprofit Benchmarks Study is just under 5% for petitions emailed to a subscriber list, with an average response rate of 3.8% (page 18). This is a bit of an apples and oranges comparison, because it’s a percentage of all members who received the petition email. The same eNonprofit Benchmarks Study (PDF | infographic) found that the benchmark conversion rate, or “page completion rate”, is 81% across the groups reporting (Page 19, or the back cover of the report. The groups reporting can be found on page 18). This number means that 81% of the advocacy group’s members who have already opened the action email, clicked the link, and arrived at the action page then go on to complete the form. So Change.org’s page conversion rate for this petition is actually lower than a nonprofit’s action campaign emailed to their members. This makes sense, as the advocacy group’s action campaign rate is sent to a self-selecting group of people interested in the cause. Change.org’s traffic, as shown here, comes from across a wide range of social media. Another way Change.org sustained the story was employee Tim Newman’s Twitter outreach. Starting around March 14th, Newman brought the Trayvon story to the attention of a cadre of targeted celebrities who might be interested in the story, and whose fans cared about the story. Newman ended up proving himself a media force all his own. In a very short period of time, Tim elicited supportive tweets from Talib Kweli and Wyclef Jean, Spike Lee & Mia Farrow, and Chad Ochocinco, creating a 900% spike in social media traffic to the petition on March 14th. By March 20th, supportive tweets were sent out by John Legend, MC Hammer, and Cher. For those of you snickering right now, MC Hammer has long been a force on Twitter, and currently enjoys 2.6 million followers. This story’s ability to gain national media attention turned out to be old-fashioned media publicity work by a few individuals involved in the case. Sustaining it, however, involved every major weapon in the left’s arsenal: progressive television channels and hosts like MSNBC and Al Sharpton delivering “air strikes,” sympathetic celebrities newly empowered to speak directly to their millions of fans using Twitter, and ultimately, an advocacy platform built from the ground up to encourage sharing. The outrage has triggered a strong response from the political right in the US, which has only further fueled the story, as salacious details about the shooter’s and the victim’s previous lives are broadcast for the court of public opinion. Protests and solidarity marches have broken out across the country. The Sanford City Council voted “no confidence” in the Police Chief handling the investigation, causing him to resign. The Miami Heat basketball team and black members of Congress have donned hoodies in solidarity (creating one of the top-watched YouTube videos of the week). The FBI and Department of Justice have announced probes in the local police’s handling of the case. And the Martin family delivered 2 million signatures to the Florida Attorney General, Sanford Police Chief, US Attorney General, and Florida’s 4th District State’s Attorney on March 26th. The petition is the largest ever hosted on Change.org, and is still growing, with 2.2 million signatures. So is Change.org, which just surpassed the 10 million member mark. As the case continues, civil rights activists in other places are working to parlay some of this newfound media attention into justice for some of the many other black men who have been shot and killed for appearing suspicious. In a conversation between Ethan Zuckerman and Jay Rosen the other night, Ethan and Jay spoke about the people formerly known as the audience, who can now assert themselves as an active public by taking part in and amplifing stories like this one. This idea is part of the bedrock of the Center for Civic Media. Signing and sharing a petition to create public pressure on negligent authorities is an active role, slacktivist critiques aside, especially compared to the passivity of the news audience just a few short years ago. I realized that Change.org’s existence is helping accelerate this transition as I saw people use a link to the petition as a vehicle to talk about this unsettling case. Now, when a story strikes the audience at their core and ignites their sense of justice, they can do something about it. And yet, the fact that this story ever reached these online masses came down to just a few individuals skilled in decidedly old-school media outreach. The media’s decision to amplify a story like this (or let it die without further attention) is a decision bordering on advocacy, in my opinion. There are, of course, many factors, from business decisions to what competitors are covering, but it never hurts to know what really works. And, apparently, it never hurts to have Al Sharpton on your side.